I’m so excited to finally share a new project launch with y’all! Most of you probably remember this moodboard, and well here are the final pieces of the project! As I mentioned in the moodboard post, Ashley and I went to school together. Sometime last month she contacted me with questions about starting a blog. It wasn’t long until we were well into working on the name, branding, and design for the whole project. It was such a blast! The design work itself might have been my favorite that I’ve done in a while. The logo came so easy, which is really unusual. However, I felt like we were on the exact same page, and I knew exactly where the design should go! From there we worked on a secondary logo and the blog design. For the blog design specifically, we knew we wanted to keep it fairly simple so that the photos and the stories themselves could stand out. As far as the blog itself, I’m head over heels for it! The main goal for Ashley and the blog is to share love stories. She’s been working in the wedding industry for a while, but she mentions that what she’s particularly inspired by are the stories behind the wedding. She’s planning on sharing her first love story this Friday, so if you check out the blog today, don’t forget to check back Friday! 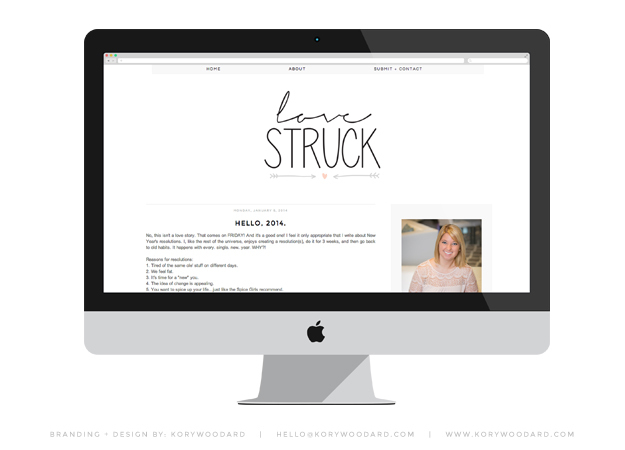 Click here to check out Love Struck! Oh I love it, Kory! It kind of has this vintage, rustic feeling – so lovely! Great job! 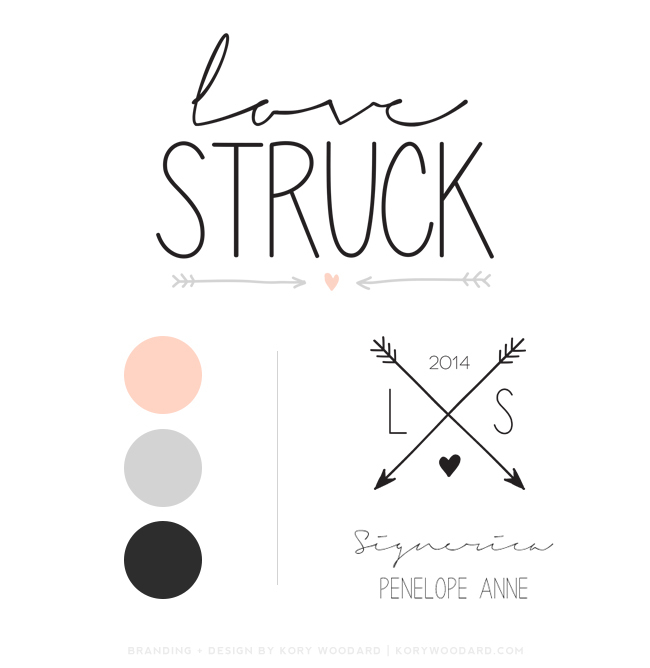 Penelope Anne is one of my favorite fonts! I use it on my blog too :) This came out gorgeous! Thanks, Gina! I have tons of fonts saved waiting for a project to use them on, and I finally found one for that font! Gorgeous! I love the logo with the arrows and heart. Fantastic work. Thanks girl! She wanted arrows incorporated, and I thought that was a perfect way to use them! Oh, me too! I hate that it’s sometimes difficult to read, but other than that it’s gorgeous! so lovely, and i love the colour scheme! Thanks! I do too! We were originally thinking of a bold color scheme, but I like what we have here! Love this Kory! Great job!